Dude really does look like a lady. Sir Richard Branson might be “sir” and founder of the Virgin Airlines empire, but he’s not one to rely on all those piles of money to save him when he loses a bet. After wagering against AirAsia CEO Tony Fernandes and coming out a loser, he donned the garb of a female flight attendant and got to work. Dressed in the bright red AirAsia flight attendant uniform — which in his case included a short skirt, natch — with shaved legs clad in stockings, lipstick and his platinum locks flowing, Branson served on a flight from Perth, Australia to Kuala Lumpur, Malaysia, reports UPI. “Dude Looks Like a Lady” by Aerosmith greeted Branson as he boarded the plane, of course. The two super rich magnates had bet that their Formula One racing teams would beat each other during the debut of the 2010 Grand Prix in Abu Dhabi back in 2010, and it was finally time for the loser Branson to pony up and meet his end of the deal. Lest you think this is just a couple of billionaires being silly on each other’s airlines, the stunt was also a fundraiser for an Australian charity. 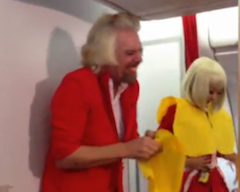 AirAsia donated $100 from each ticket sold on the 300-passenger flight to the Starlight Children’s Foundation, and bidders also competed before the flight for the chance to shave Branson’s legs. That’s at least going to make for a great cocktail party story, especially if the high bidder kept the razor. Previous If People Want To Drink Raw Milk, Should Dairy Farmers Be Able To Sell It To Them?